Every city has its defining characteristics that make it unusual and attractive. Seattle has the ferry system and Pike Place Market, Los Angeles has the film industry and beaches, San Francisco has the cable cars and all of its hills… Well, the coolest San Francisco’s hills is for sure Telegraph Hill, and the wonders of Telegraph Hill are the Greenwich and Filbert Steps parrots and homes. 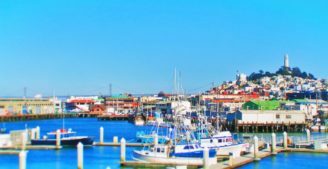 After we shared what we think is the gem of San Diego, Cabrillo National Monument, it only makes sense that we share the other West Coast gems. 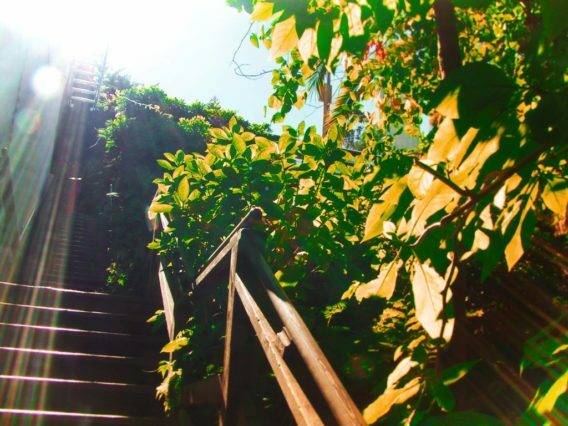 Playing tourist in San Francisco is so easy and you might not even realize the incredible places you’re passing by, and that’s why sharing the marvel of the Steps on Telegraph Hill is important, especially its resident parrots. Check it out! 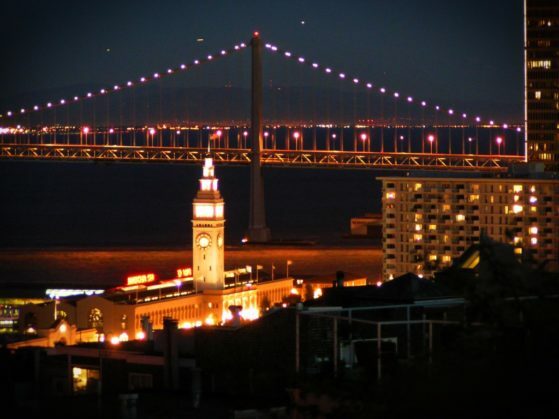 If you’re familiar with San Francisco, you know it’s a city of neighborhoods. While each is awesome and fun in its own way, North Beach is extra special. It’s full of Italian restaurants, Greek food, and more coffee than you can shake a stick at. It’s also the western base of Telegraph Hill, which is our focus. After you’ve crossed through Chinatown, skirted lower Russian Hill, and ogled Lombard St, you have to decide where to go next. 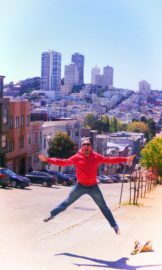 Do you head down Columbus Ave to the Wharf and Pier 39 (so many tourists) or do you climb one of the steepest hills in all of San Francisco? 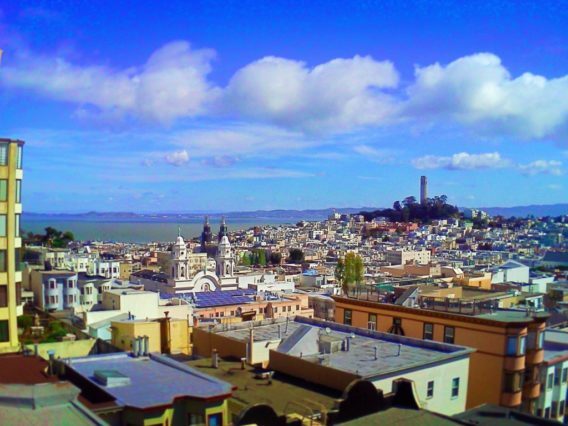 Of course you climb Telegraph Hill. 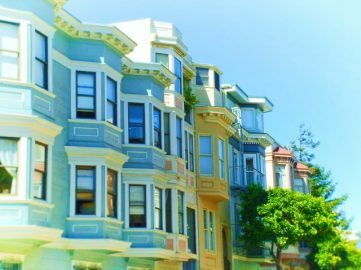 Even though it’s not the largest or most visited area of San Francisco, Telegraph Hill is the coolest and most SFish of them all. And on the Filbert Steps you’ll find parrots! In SF! Crazy! Note: we’re assuming that you’re experiencing San Francisco as all of us who have lived there do: on foot. There’s no need for a car in San Francisco and it’ll be more of a burden than useful. And once you go on our little adventure to find parrots and hillside gardens, you’ll be glad you don’t have to hike back to your car. 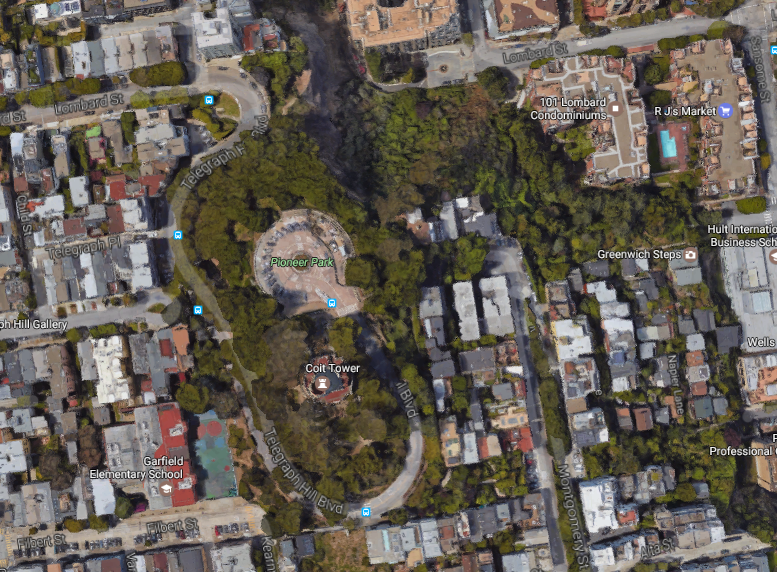 From the top of Telegraph Hill between Coit Tower and Pioneer Park (by the statue), you’ll see a path leading you back down Telegraph Blvd. You’ll only be able to do this ON FOOT. Be sure you’re walking against traffic and keep an eye out on your left. You’ll see an opening in the rock/brick wall that lines the street, and then stairs just past it. 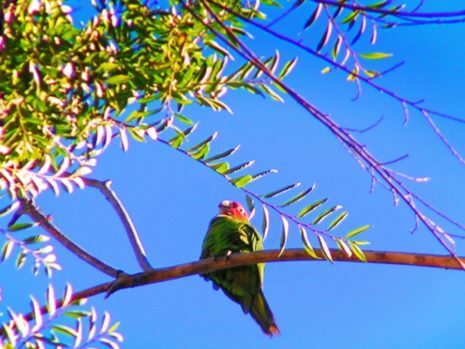 This is the start of your adventure to find the parrots of Telegraph Hill. Head down the stairs and enjoy the coastal neighborhood forest which rapidly turns into active gardens with loud birds all around. 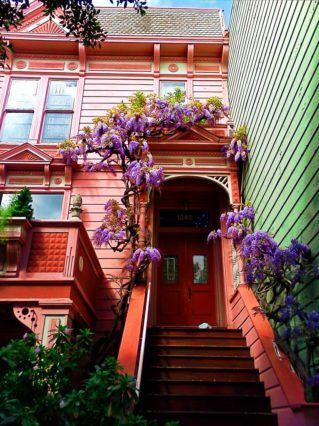 From adorable houses to depression era Art Deco apartments, the homes around the Greenwich and Filbert Steps are perfectly San Francisco and you’ll wish you lived there. Or at least you’ll wish so until you see how expensive, I mean exclusive, the cost of living on Telegraph Hill is. 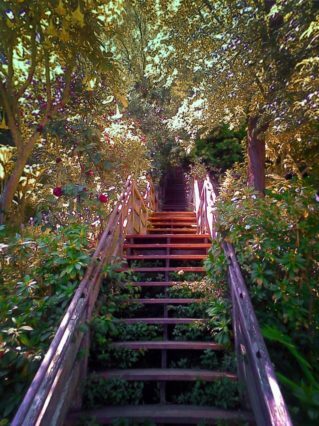 The only ones who don’t have to pay the crazy rent are the Filbert Steps parrots. 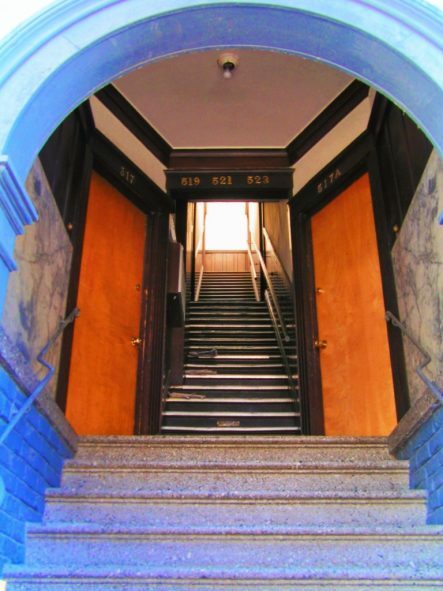 Leaving the brick and concrete steps of Greenwich, make a right when you hit Montgomery St. 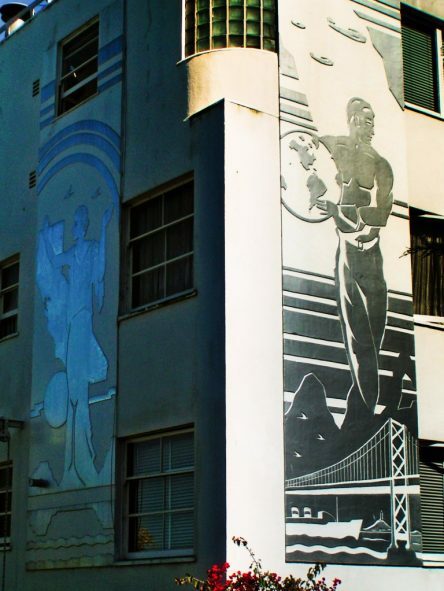 In about forty yards, you’ll see the most beautiful Art Deco apartment building with shining silver pieces of art on each side as tributes to the State of California. 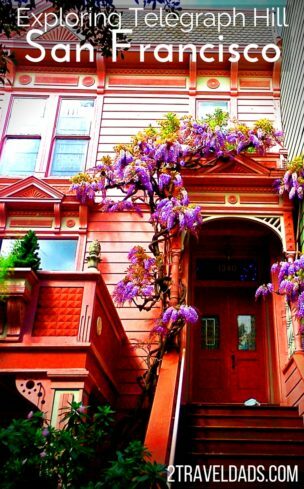 When you see this iconic Telegraph Hill building, you’re at the top of the Filbert Steps. Head down the Filbert Steps and you’ll find that the gardens have become even more intense and the boardwalks even more charming. You’ll cross several pathways, including Napier Lane, which may take you to other stairways, but stick to the Filbert Steps. Walk carefully, as you don’t want to tumble to the base of Telegraph Hill (quite the drop off), but be sure to look up and watch for the parrots. Tip: there are lots of benches in each of the Steps areas. 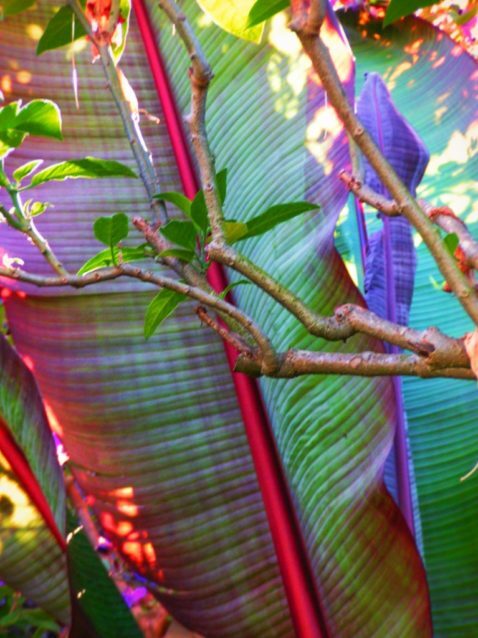 Take breaks often and enjoy the coolest neighborhood on the West Coast while you listen for and spy on the parrots. 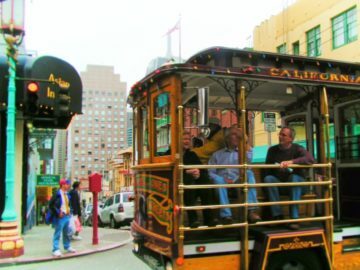 Make a left to Fisherman’s Wharf, the San Francisco Maritime National Historic Park, and Peir 39. 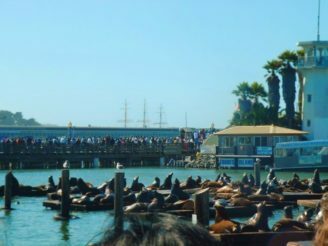 Tip: Check out our post on Bay Area National Parks for ideas down around the Wharf and all over Golden Gate Park. 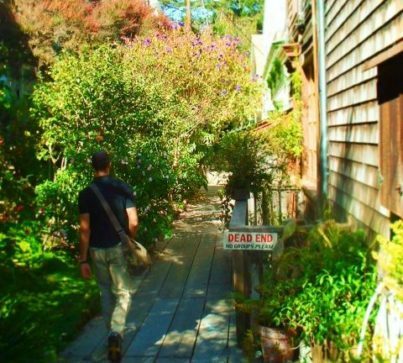 Yes, we’re telling you to go walking through these intimate gardens and quaint neighborhoods. Yes, we’re telling you to linger and enjoy the sights. Yes, people ACTUALLY LIVE HERE. Remember as you’re walking either the Greenwich or Filbert Steps that you’re going past people’s front doors and you’re admiring their gardens. Part of what makes Telegraph Hill, and really all of San Francisco, so special is that it’s all still a living, working community that seems a bit frozen in time. Respect the gates in front of the houses. Don’t go onto somebody’s deck even though you know it’ll be a cool pic. Don’t pick the flowers that somebody tends to daily. Just go, walk through, and be sure to compliment the people you meet whose homes you’re strolling past. 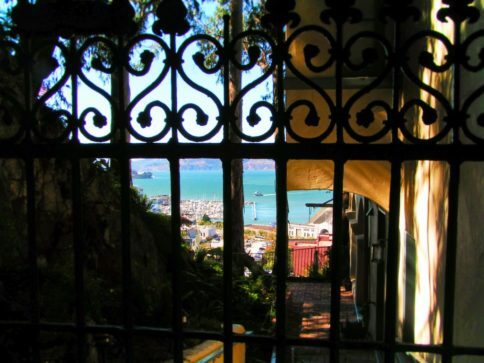 I know, the whole neighborhood is gorgeous and out of this world, but there if you want some specifics about what to watch for, here are our top three Eye-Spy games to play when climbing the Steps of Telegraph Hill. This seems like a no-brainer, but as you descend the Greenwich Steps and then the Filbert Steps, watch how the gardens change. This hillside has been tended to for 150 years and it’s truly a treasure. 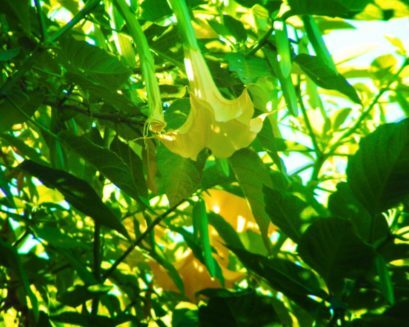 A fun flower to watch for is the Angel Trumpet. It’s super easy to spot because the flowers are enormous and there are so many on any given plant. 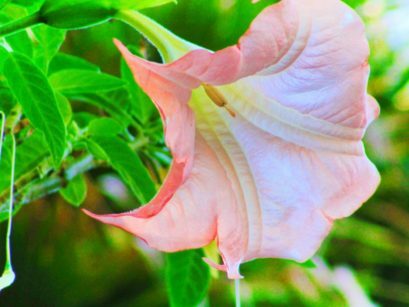 It’s one of the flowers that makes Telegraph Hill so magical. 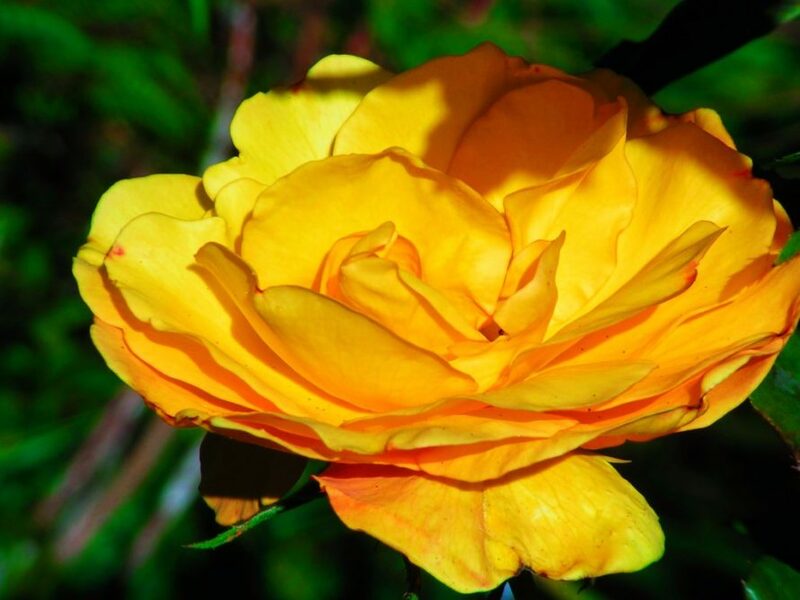 Also watch for bee boxes, vegetable gardens and some of the craziest rose bushes ever. It’s a horticultural dream! 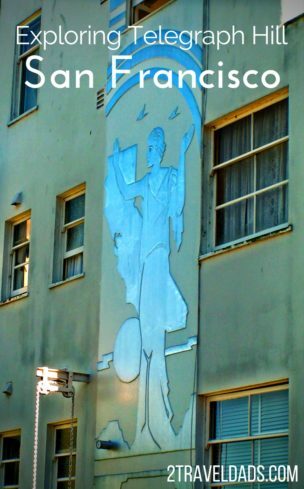 We already mentioned our favorite pieces that you’ll see as you’re exploring this part of Telegraph Hill, the gigantic Art Deco characters at Filbert and Montgomery, but there are many other smaller pieces of art. From murals hidden behind bushes to stained glass in many of the houses, you’ll have fun appreciating all that you’ll see. In addition to the art, watch for really interesting architecture. The homes are built on the steep hillside and are set among a network of boardwalks and staircases. 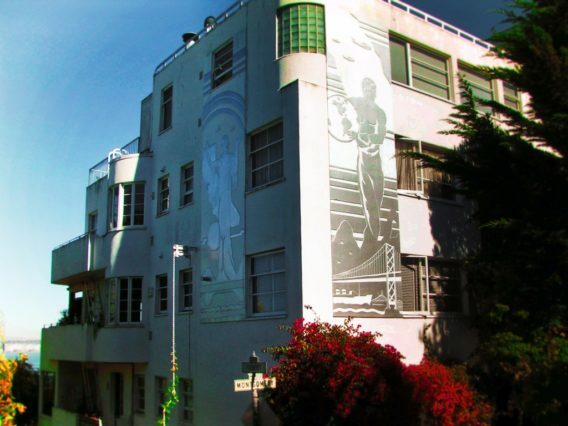 Every corner you turn you’ll gasp at how cool each house or apartment is. Oh, and on Greenwich there is the coolest circular stone wall… but you have to seek it out. Okay, this is the best part and probably why you’re reading this. There is a flock of feral parrots that live on Telegraph Hill and make the Filbert Steps their home. They are a type of parakeet called cherry-headed conures and they’re loud and adorable. When you’ climbing or descending the steps of Telegraph Hill, keep an ear and an eye out for the flock or even rogue birds. We’ve gotten to see them several times and they add such an interesting magic to the neighborhood. 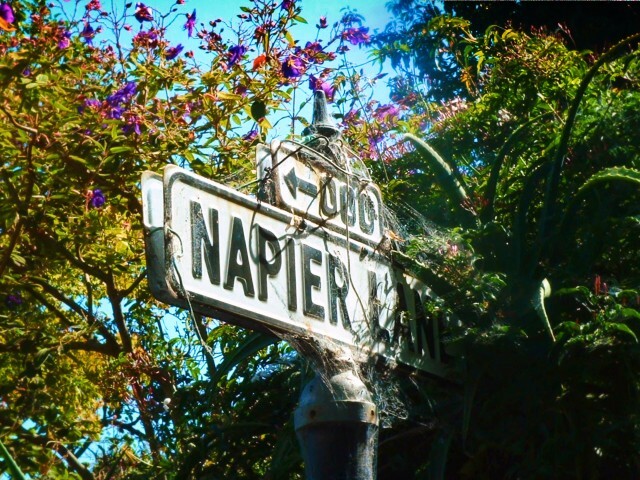 The parrots of Telegraph Hill are a one-of-a-kind treasure and unique to this one San Francisco neighborhood. 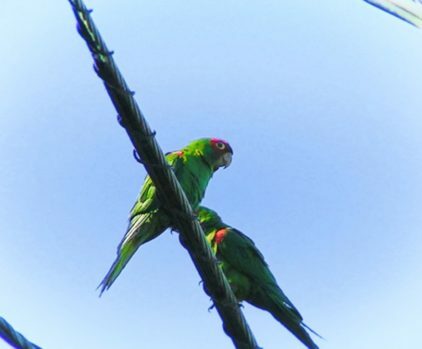 Tip: for a kind of cool documentary night at home, watch the Wild Parrots of Telegraph Hill. It’s both cool and weird and will help you understand the birds, the neighborhood, and the SF culture. Have you ever seen such a charming pocket of awesome within a city? 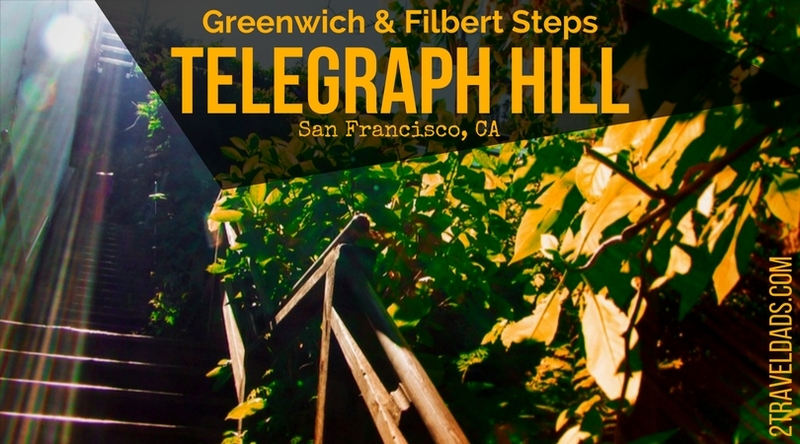 Ever since the very first time I came across the Greenwich and Filbert Steps on Telegraph Hill they’ve been my favorite of the many San Francisco sights. 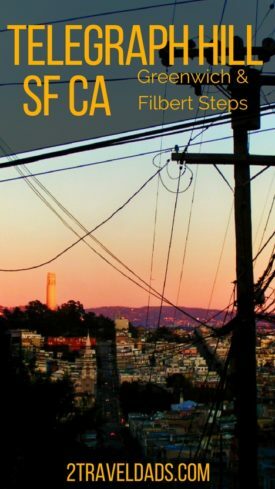 So, next time you’re rolling through the City by the Bay are you going to find the time to climb the steps? How can you not!?!? 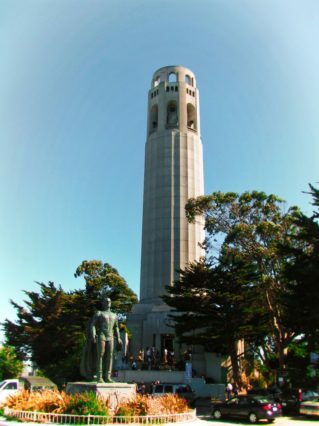 Want to pin this so you don’t forget to visit Telegraph Hill when you’re in San Fancisco next? Go for it!!! Greenwich Steps – start from Telegraph BLVD at the top and Sansome/Greenwich at the bottom. Filbert Steps – Midway down the Greenwich steps you’ll come to Montgomery, so make a right for 50 yards or so and you’ll see Filbert. These steps also end at Sansome.